Comments: Broadleaf evergreen native to Norfolk Island in the Pacific between Australia and New Zealand. 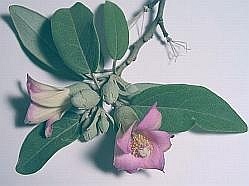 Gray-green 2" ovate leaves, and pink to purple flowers with a prominent yellow stamen. Height to 40' when mature making it the largest hibiscus plant species. Caution: seed pods have short bristly hairs that irritate the skin. Also known as a Primrose tree or Norfolk Island Hibiscus. 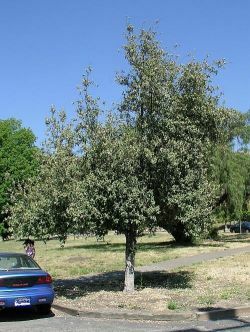 This tree was identified by Dan Rivera.